In my little world, baseball is important. I like watching it almost as much as birds. So don’t be too surprised that my favorite news story in 2013 didn’t involve feathers. On July 15, Greg Van Niel, my new role model, collected four foul balls during a game at Progressive Field, home of my beloved Cleveland Indians. Van Niel is a season ticket holder so he goes to a lot of games. He’d never caught a single foul ball until the day he snagged four. I don’t know if Van Niel is a birder. If he is, I like his chances of finding an ivory-billed woodpecker. Check that, the bird will find him. Luck comes in pretty handy when birding. Just ask Matt Daw, a 19-year-old birding whiz who on July 7 was shooting video of a least bittern at Bosque del Apache National Wildlife Refuge in New Mexico. Then something unbelievable: into the picture strolls a rufous-necked wood-rail, a species never before seen in the United States! The discovery made national news and sent birders around the nation scurrying for airline tickets to Albuquerque. From late January through mid-April a varied thrush visited a backyard in Evanston. Homeowners Jason and Judy Kay deserve a gold medal for welcoming the hundreds of birders who went their alley to catch a glimpse of this rare avian visitor from the Pacific Northwest. The thrush was my 500th life bird. Other lifers in 2013: Louisiana waterthrush (finally! ), Mississippi kite, Thayer’s gull, glaucous gull, red-throated loon, Ross’s goose, Eurasian tree sparrow and Le Conte’s sparrow. All were seen in Illinois. Like the varied thrush in Evanston, it amazes me how long a vagrant bird will sometimes stay put. An evening grosbeak hung around Rosehill Cemetery in Chicago throughout February and March. On Nov. 7, Margaret Mechtenberg triggered a bird rush by reporting a Townsend’s solitaire at Jon J. Duerr Forest Preserve in Kane County. A lifer for many, the bird was still present in early December. By the way, pretty cool to see an email update about the solitaire on Nov. 19. Submitted by Jon J. Duerr. I finally tracked down a pileated woodpecker at Morton Arboretum in 2013, but my friend Diann Bilderback pulled off something far more remarkable. On Sept. 29 she ran the table by spotting all seven local woodpecker species in one place, Elsen’s Hill in Winfield. That would be pileated, red-headed, red-bellied, downy, hairy, northern flicker and yellow-bellied sapsucker. Congrats as well to Aaron Gyllenhaal for shattering the Big Year record for Cook County, a mark that stood for 23 years. He’d seen 281 species and was still counting as this went to press. Aaron is 16 and a member of Illinois Young Birders. National and state Big Day records were established too! Team Sapsucker from Cornell smashed the North American mark by seeing or hearing 294 species in 24 hours on April 25. They did it in Texas, beating their old record by 30 species and raising $325,000 for the Cornell Lab of Ornithology. The new state Big Day record is now 191 species, achieved in May by a team of six in southern Illinois. So many sightings, so little space. What a year for DuPage! Prairie warbler at Hidden Lake. Blue grosbeaks at the Arboretum, Elsen’s and Danada Forest Preserve. Upland sandpiper at Springbrook Prairie. A Northern goshawk in Downers Grove. American anhinga, golden eagle and Say’s phoebe thrilled observers at the Greene Valley Hawk Watch in Naperville. The hawkwatchers also registered 17,500 sandhill cranes passing over the hill on Nov. 23. The word spectacle was invented for days like that. Let’s not forget Fermilab. It was a banner year for the Batavia hotspot: Wilson’s and red-necked phalaropes, buff-breasted sandpiper, piping plover and the site’s first-ever white-faced ibis. Three American avocets arrived at Fermi on Oct. 26 and stayed for weeks. 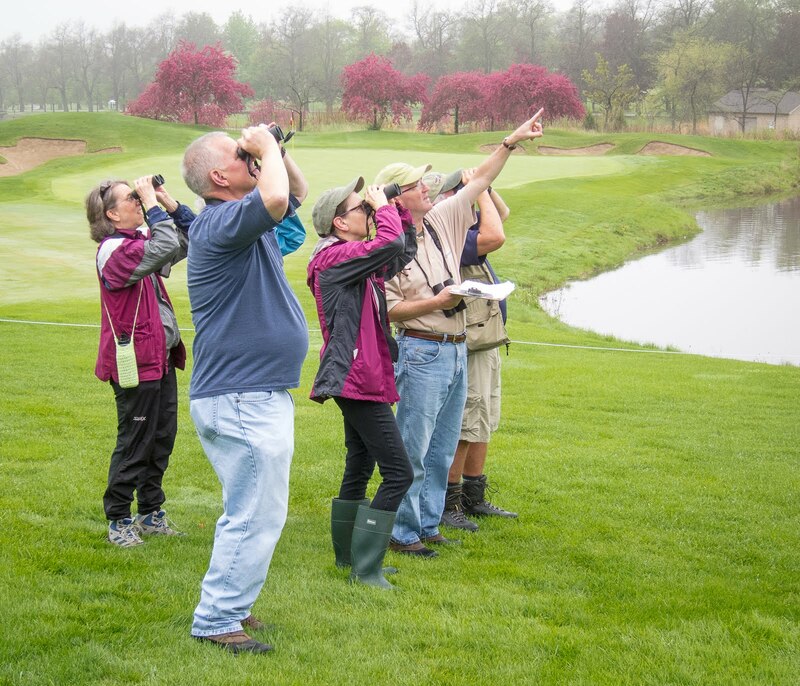 I do most of my birding at Cantigny Park, where the site list grew to 143 species. Kyle Wiktor, a young birder with incredible ear-birding skills, helped locate our first-ever clay-colored sparrow in June. Northern shrike was another first-timer at Cantigny, first in March and then again in November and during the Christmas Bird Count on Dec. 14. Many local birders traveled to southern Wisconsin in March where two great gray owls were discovered well south of their usual winter range. One of the owls was in Middleton, a suburb of Madison and home to Eagle Optics, a birder’s mecca. Now that is a well-placed bird! My biggest surprise of 2013 was finding a great-horned owl pellet with a shiny aluminum bird band inside. The band was still attached to the leg of a female wood duck. Only one new yard bird for me this year, a pine warbler in late April. I’m at 113 species. We watch all kinds of wildlife, of course, and most of us witnessed the invasion of white-lined sphinx moths in September. They looked and acted a lot like hummingbirds. I'll remember my first luna moth sighting, too. 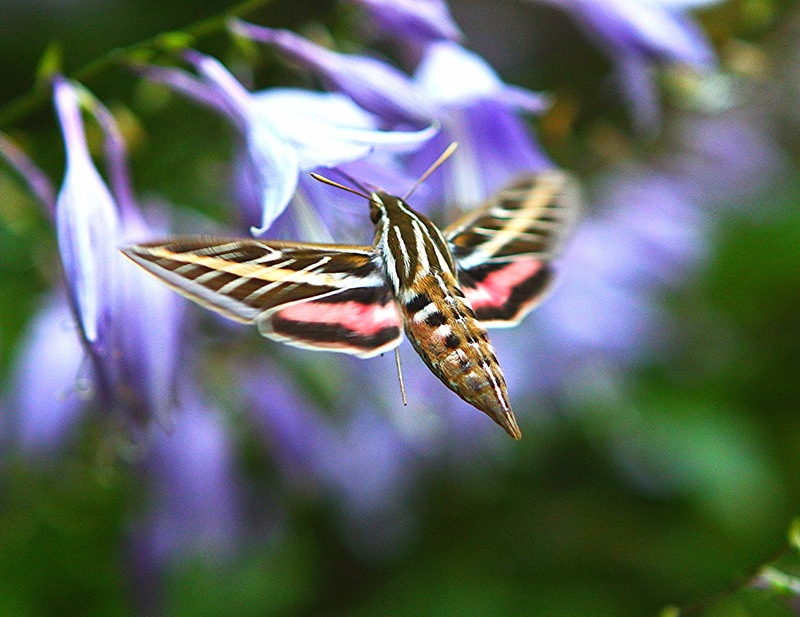 One fluttered out of a garage at Cantigny Park in broad daylight. I felt even luckier later in the day when I learned that lunas only live for a week. The award for Best New Bird Statue goes to College of DuPage in Glen Ellyn. Have you seen their (way) larger-than-life roadrunner? But please, call it a chaparral, the school mascot. “A Birder’s Guide to Everything” with Ben Kingsley debuted at the Tribeca Film Festival. Still haven’t seen it, but will. “Avian Architecture,” by Peter Goodfellow. Still haven’t read it, but will. If you follow the NBA, you know the Pelicans recently hatched in New Orleans. Love the name choice. Two other things I love: Naperville announced a 5,000-square-foot nature center at Knoch Knolls park, and a huge expansion is underway at Willowbrook Wildlife Center in Glen Ellyn. Yay! Expect a lot of ink to be spilled in 2014 about the passenger pigeon, a species that went extinct 100 years ago. I’ll be reading Joel Greenberg’s new book on the subject. My favorite read of 2013 was “Wild Duck Chase,” about the federal duck stamp contest. Bill Rapai’s book on the Kirtland’s warbler was excellent, too. Speaking of stamps, wait until you see the new hummingbird stamp coming in 2014. It’s a beauty of 33-center, for postcards. Backyard birders will miss the Wild Bird Center in Wheaton, which recently closed its doors. Best of luck to former owners Cathy and Paul Matovich—nice people who did a lot for our hobby. Already it’s been a great winter for snowy owls on the Chicago lakefront. Birders at Montrose were treated to four of them at once on Dec. 13. Reminder: You have until Feb. 16 to go see the Charley Harper art exhibit at the Lake County Discovery Museum in Wauconda. Finally, for those who need to know (like me): the International Ornithological Union’s current World Bird List says there are 10,582 species. Have fun watching them in 2014. Copyright 2013 by Jeff Reiter. All rights reserved.